A research project involving the University of Southern Queensland is uncovering the almost-forgotten history of the Queensland Native Mounted Police. The project is shedding light on the history of the settlement in Queensland and the often-unacknowledged degree of resistance by Aboriginal traditional owners to land theft by Europeans. USQ Professor Bryce Barker is part of the team that is locating the former campsites used by the Queensland Native Mounted Police. Native police units usually consisted of recruited mounted Aboriginal troopers under the command of white officers. Prof Barker said the project was uncovering important material evidence of frontier conflict. “Although widespread violence and massacres certainly did occur – and we have good documentary evidence for this – actual physical evidence of these sorts of incidents is difficult to find because of the nature of this violence,” he said. So far, the team has recorded nearly 200 locations, which were maintained over a period of 50 years. “The fact that a paramilitary force had to be maintained in Queensland for this period is testimony to the scale of resistance by Aboriginal people, to the theft of their land,” Prof Barker said. 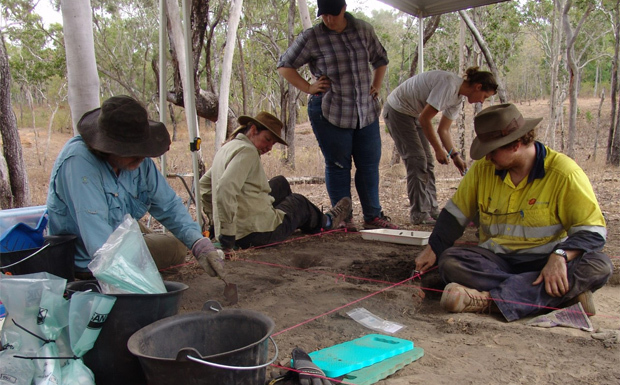 Archaeological excavations at seven of the locations have revealed how the Aboriginal troopers and their white officers lived. Common artefacts associated with Native Mounted Police camps have been found, including distinctive military police uniform buttons, cartridges and bullets from Government-issued Snider rifles and alcohol bottles. The research team is working closely with Traditional Owners as well as the descendants of Native Police and European settlers at some locations. Other researchers involved in the project include Associate Professor Heather Burke, from Flinders University; Dr Lynley Wallis, from University of Notre Dame; and Dr Noelene Cole, from James Cook University.